Be honest. Most of us have done it at least once, and if you’re like most business owners, you’ve probably searched for your business on Google as well. How did you phrase your search? If you typed in your exact business name and location, you probably saw your business dominating the results and felt great about how visible you are. But think about it. How many of your customers would search for your business that way? Most importantly, how many consumers who are not yet your customers would search for your business by name? Not many. Most consumers search for the products or services they need instead of an actual business name. Go ahead and give it a try. Type in the primary service your business provides, followed by your city and state. Really, go ahead. I’ll wait. Well? What did you find? Did your business dominate the first page of the search results like you hoped? Were you outranking all your local competitors for those top spots? If you were, congratulations! That’s a major achievement. But if your business ranked close to the bottom, or worse, on the second page or beyond, your chances of snagging a new customer who is searching online for the service you provide is severely limited. So what gives? 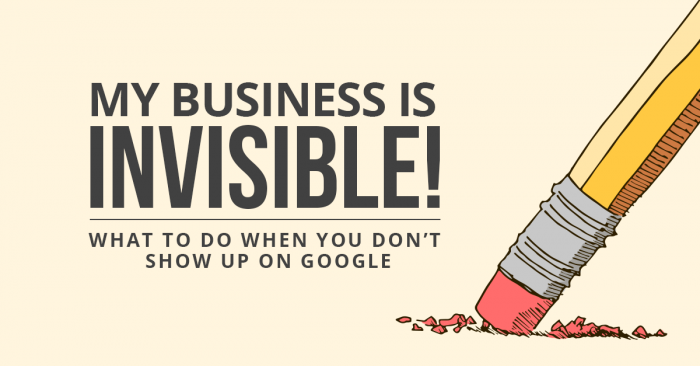 Why is your business all but invisible on Google, and what can you do about it? To get to the root of the problem, you’ll need to do a little digging, and make a few changes to your local online marketing strategy. Check your citations for errors, and have a plan to stay on top of them for the long haul. Your business’ citations, or online directory listings, play a significant role in how your business appears on search engines like Google. The most prominent of these is, of course, Google My Business, and that listing should be your very first stop. Is all the information on this listing up to date and correct? Is the listing verified? Have you made sure to fill out as much information as possible on this listing? If not, getting this listing properly optimized is square one. But even if you never set them up yourself, there are likely hundreds, if not thousands of other online directories that are constantly feeding information about your business to Google. If just one or two of the more important listings contains incorrect information, they could have spawned a host of other inconsistencies, and even cause your Google listing to repeatedly become unverified or display incorrect information. To fix the problem, you’ll need to have a full citation review performed so the extent of the problem can be determined, and the source of the incorrect information resolved. To prevent a repeat occurrence, a review should be performed regularly. While your citations and the consistency of your business’ name, address, phone number and website (NAP+W) directly impact your business’ performance in local search results (for example, on Google Maps), your organic visibility is another, more complex story. You see, gaining those first-page spots on Google takes a well thought out strategy, and a plan for ongoing maintenance, or optimization. SEO involves a lot of different factors, and no two businesses are alike. But while there is no such thing as a truly one size fits all plan for effective SEO, there are a few common denominators that SEO professionals will look at first. Is your website mobile optimized and quick to load? While Google’s ranking algorithm is a closely guarded secret, we do know quite a bit about what signals the search engine is looking for, and mobile responsiveness and page speed have long been one of the top ranking factors that we’re aware of. Google wants to provide its users with the best experience possible when they search for something online. That means a website that is easy to access from any device, mobile or desktop, and one that doesn’t take forever to load. (When it comes to websites, “forever” is more than a few seconds) An SEO professional can take a look at elements in the code of your website that might be causing it to under-perform, and in turn, be overlooked by Google for your most competitive keywords. How is your keyword strategy? Is the content on your website high-quality? In keeping with Google’s desire to provide a high-quality experience, it also wants to present its users with the most relevant information possible. Have you ever typed in a search query and landed on a page with completely useless information? Annoying, right? We’ve all been there, and that’s exactly what Google is trying to fix. That means filling your website with useful, quality content that can’t be found anywhere else on the internet, organizing it in an intuitive way throughout your site, and incorporating realistic keywords and search terms that your customers are likely to use are more important than ever. Nothing kills an SEO strategy for small businesses like stuffing your website’s content full of unnatural sounding keywords or using keywords that don’t reflect the services and products you actually provide. SEO copywriting is a delicate mix of art and science. When done correctly, it can mean major gains for your business, but when done poorly, it can lead to near invisibility for important search terms. There are many other factors at play when it comes to the SEO strategy for your small business, and it’s worth having a professional take a look under the hood to locate any other problem areas. The fact is, SEO is often overlooked by many small business owners, and having a solid SEO strategy in place for your business, even as basic one, could give you an advantage over your competition. Despite the common misconception, SEO is not as expensive as you might think, and when implemented correctly it can be a powerful tool for driving growth. To gain the very top spots, you might need to pay to play by paying per click. So your business is ranking well in the local search results (Google Maps) and you’ve conquered page one of the organic search results, but your competition is still snagging the virtual real estate at the very top of the page. How can that be?! While they’re often confused with organic or local search results, those businesses at the very top of the search results are actually there because they paid to be there. Their secret? A Google AdWords, or Pay-per-click (PPC) campaign. Whether you have an established presence in local and organic search rankings or you’re just starting out marketing your business online, PPC advertising plays an important role in your overall digital marketing strategy. This is especially true for service-based businesses like plumbers and contractors who now find themselves largely at the mercy of a new feature released by Google in 2017 called Google Local Services. But PPC advertising isn’t just for service providers. Pay-per-click allows any business to display their business information to Google users searching for specific search terms (or keywords) in a specific geographic area. It lets your business gain page one visibility right away while connecting in real time to people who are actively searching for what your business provides. It’s pretty powerful stuff, this pay-per-click. In order to beat out the competition for the top paid spots on Google’s search results, you’ll need to make sure that you’re running a properly optimized and managed pay-per-click campaign. While Google offers something called AdWords Express that’s billed as a “set it and forget it” PPC tool, small businesses often find themselves wasting money on irrelevant keywords and paying for clicks that don’t convert. In the long run, a professionally managed campaign is much more cost effective because Google certified PPC specialists know just what to look for when searching for valuable opportunities that lead to real results. Not all PPC is created equal. Only pay for clicks on major sites and search engines that people actually use. Pay-per-click exists on many different platforms, from Google to Bing, Facebook to Youtube, and everything in between, including private networks of sites and websites run by the big name phone book companies. Before you decide whether it’s worth paying for those clicks, first ask yourself where you search for products and services on a regular basis. Chances are the answer is right in front of you on your cell phone or laptop’s web browser, and that most likely means you’re searching on Google or Bing. Whether you’re looking for a quick boost in visibility or a competitive edge against the competition, PPC offers measurable results that can deliver more phone calls and more leads in short order, and for a budget that you have total control over. Google rankings are the gold standard of online visibility, and it takes time and strategy. Getting to the top of Google search results has long been the gold standard for businesses of all shapes and sizes. While the process takes time and a solid strategy, the good news is there’s never been a better time for small businesses in particular to embrace online marketing and search engine optimization. If you’re not currently dominating the search results in your immediate area, you’re missing out on a valuable opportunity to bring in new customers, and chances are it’s due to errors in your internet presence like messy citations, a poorly optimized website, or being out-bid in Google AdWords. Want to find out how your business’ online presence stacks up? We offer a free digital marketing evaluation that will give you an inside look at what your competitors are doing, and which opportunities you’re currently missing out on, as well as any errors that might be impacting your business’ performance on Google. Want to find out more? Just let us know. We’re all ears!